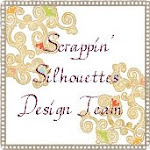 Another wonderful sketch by the ever talented Jennipher can be found over at Scrappin Silhouettes. I love these sketches soooo much and am so glad to be a part of the design team as they are such an amazing group of ladies. Please go over to the website to see what everyone else has created there is loads of INSPIRATION over there!! I used 4 photographs and cropped them to roughly fit the sketch. We had a great day walking in the 'Bluebell woods' in May but it was late in the season so most of the bluebells had died but I managed to find a few for my snaps! It is a pretty simple LO with just card, paper. photographs letters and the only embellishment is a few flowers that you can just about see.